Who doesn’t love a piece of chocolate? I especially like those dark chocoloate bars combining surprising flavors. My favorite bar is the one with seasalt by “Tony Chocolonely”. I wish they would sponsor me for saying this but unfortunately we still spend quite a lot of money to supply ourselves in our addiction… I’ve been experimenting with smoking chocolate for a while now but never used it in a real recipe. The love for delicious chocolate bars and the experience woodsmoke adds an interesting depth to the chocolate made think about how I could use it for a dessert. 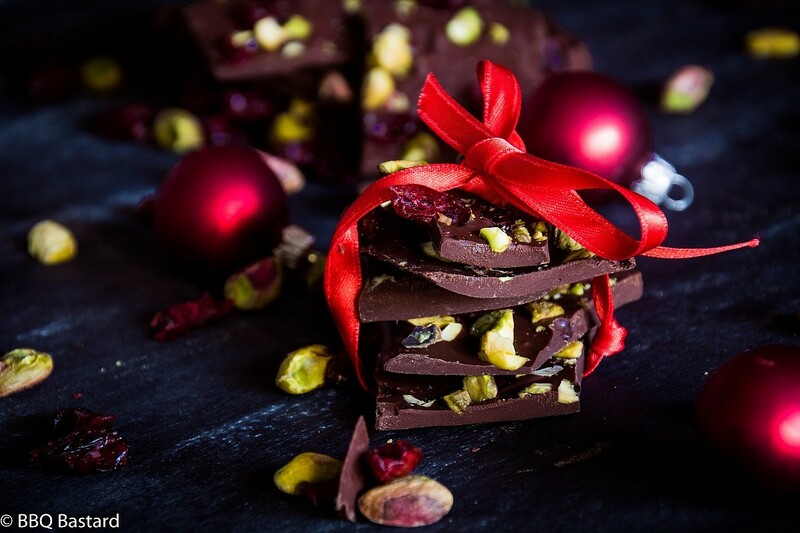 Here’s the result: “Smoked chocolate christmas bark”. Best part of the smoked chocolate bark? It’s one of the easiest recipes I ever made and you can add the toppings you desire. I opted for pistachio and cranberry to make the Christmas feel visible. But before you can add the toppings you need to melt your chocolate. 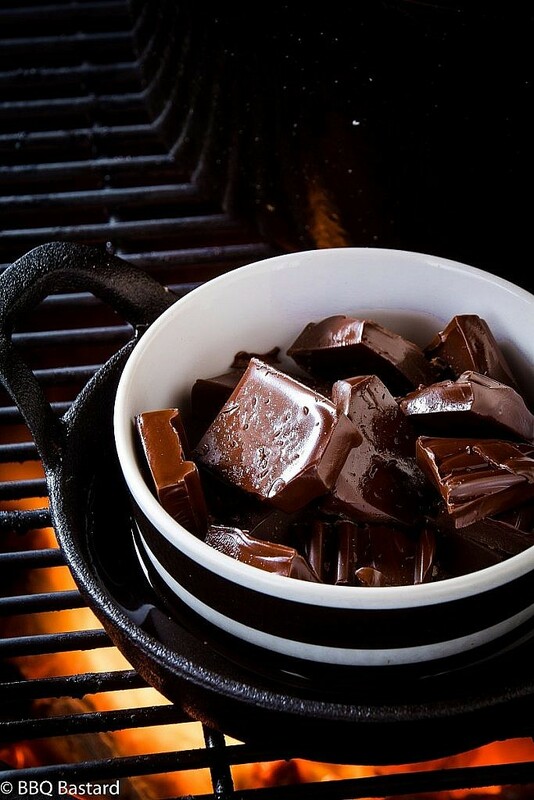 This is the part where you can add the smoke flavor by melting the chocolate au bain marie in a BBQ with closed lid. Add the type of wood chunks you prefer to the hot coals. I used grapevines to get a subtle smokey flavor. If you like a heavy smoke taste you can melt all chocolate this way. I opted for subtility and used half smoked, half regular chocolate to form the bark. Once the chocolate is molten you pour it on a large baking tray with greaseproof paper. This needs to be done quickly. 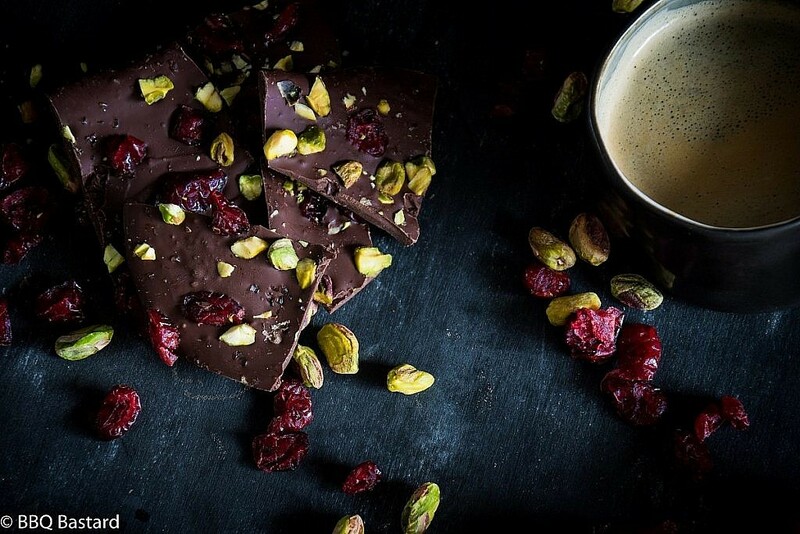 Add the roasted pistachio and cranberries to the chocolate and put the chocolate in the fridge for an hour. Once the chocolate is firm you can crack the bark in pieces and serve them for dessert. I served them last weekend for my friends who came over for dinner. They seemed to appreciate the unique flavor of the chocolate. And if they didn’t my son does… He keeps on asking for it. Not only because he likes to help but he would eat more of the chocolate than I do. 1. Light your BBQ for direct cooking over hot fire. Meanwhile prepare a plate with greaseproof paper so you can work quickly when the chocolate is hot. 2. Add a large skillet filled with water on your grid. 3. Toss a couple of wood chunks in the fire and wait until the smoke turns blue. 4. Add half of the chocolate (1 bar of 100 gr. devided in small pieces) to a fireproof bowl and place the bowl in the water (au bain marie). Close the lid. Open every 2 minutes to stir in the chocolate. When it's molten and shining you can remove the skillet from the fire. 5. Add the other pieces of chocolate (100gr. ) to the fire on an indoor pit and cook au bain marie until all of the chocolate is molten.. You can add all of the chocolate at once but the smoke flavor might be overwhelming if you do. 6. Now you need to work quick. 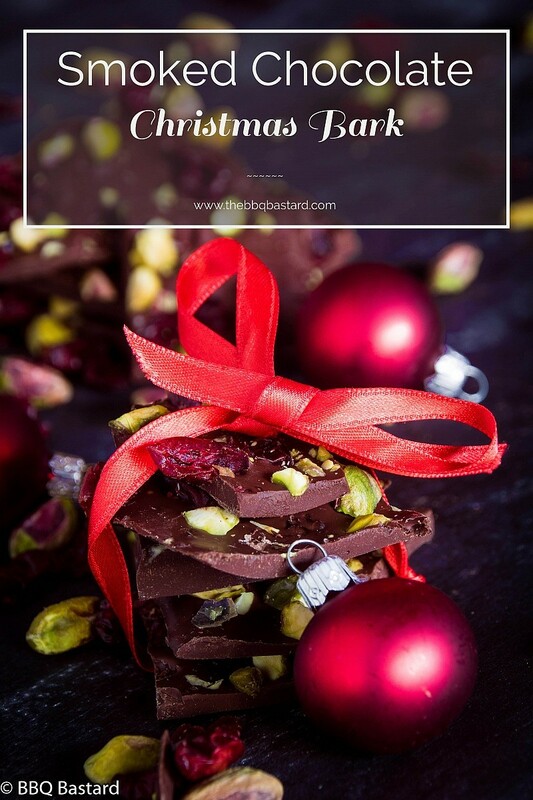 Pour the molten chocolate on the greaseproof paper, spread it equally and sprinkle roasted pistachios and cranberries on top. 7. Put in the fridge for 2 hrs. Now your delights are ready to serve!